There’s a lot to love about the 2017 Ram 3500, but one of the greatest things to admire is how functional this truck is. Not only is it a looker, but it also is powerful under the hood and strong enough to get the tough jobs done while its extreme durability allows it to stay in pristine condition. Learn what there is to love about the Ram 3500 today by reading below! The 2017 Ram 3500 is good at providing Regina drivers with options in the powertrain department. A total of three powerful engines make up the series of available engines. The first engine option is a 5.7L Hemi VVT V8 which prides itself on being able to deliver as much as 383 hp and 400 lb-ft of torque. 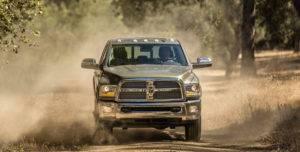 The second engine, a 6.4L Hemi VVT V8 ramps torque up to 410 lb-ft. Finally, the most powerful available engine, the 6.7L Cummins Turbo Diesel I6 is prepared to conquer anything that stands in its way with up to 385 hp and 900 lb-ft of torque. All this power under one hood only means more fun for Saskatoon drivers. Access to such beefy engines lends itself to allowing the truck to provide Saskatoon drivers with a lot of impressive capacities and performance that is sure to wow. When properly equipped, the 2017 Ram 3500 can tow up to 14,157 kilograms, carry a payload of 3,352 kilograms, and have a total GCWR of 17,735 kilograms. So, to sum things up, the Ram 3500 can carry a lot of cargo and do so effortlessly. However, the Ram 3500 can’t accomplish all of this without a little help from the expertly designed chassis, more specifically, the suspension setup. For this truck, developers went all out and provided the vehicle with a ton of high-end, high-performing suspension combinations to ensure that nothing goes wrong while you’re pulling those 14,157 kilograms of cargo around the worksite. For example, the 3500 comes equipped with a heavy-duty rear suspension, three-link front suspension, dual rear wheel suspension, and a segment exclusive auto-level rear air suspension. When all of these come together, there’s no way anything is going to mess with the Ram 3500 stability. It’s crystal clear that the 2017 Ram 1500 has a ton of powerful engines to choose from, well-equipped stability systems, and incredible towing power. Get to know the Ram 3500 a little more intimately today by taking a trip down to Crestview Chrysler where our team will be waiting to show you the ins and outs of the 3500 as well as our large stock of other new and used trucks. You can find us at 601 Albert Street in Regina or reach us by phone to get the ball rolling as soon as possible.